Mucormycosis is an uncommon opportunistic infec-tion that is caused by Mucorales from the Zygomycetes class. Patients with severe immuno-deficiency admitted to the hospital are at greatest risk for developing this infection. Mucormycosis usually is transmitted in humans by inhalation or inoculation of spores in the skin or mucous membranes. A 66-year-old man developed a surgical wound infection at 1 week after kidney transplant that did not improve despite broad-spectrum antibiotics and debridement. He was transferred to our hospital 45 days after transplant and had fever and a large purulent wound that was surrounded by a black necrotizing margin. Immunosuppressive drugs were discontinued and the dosage of prednisolone was decreased. Massive debridement was performed but was incomplete because he had full-thickness abdominal wall necrosis. Histopathology showed broad fungal hyphae without septation, consistent with the diagnosis of mucormycosis. Despite antifungal therapy with amphotericin B and additional debridement, the patient died of septic shock at 52 days after kidney transplant. Cutaneous fungal infections should be considered in the differential diagnosis of any nonhealing infected wound that does not respond to broad-spectrum antibiotics, especially in patients with predisposing risk factors such as transplant. We treated a patient who died because of cutaneous mucormycosis after kidney transplant. The purpose of this report is to describe the clinical course of this patient and increase awareness about the possibility of this infection in patients after kidney transplant. A 66-year-old man was evaluated for fever and wound necrosis after a kidney transplant. He had end-stage renal disease for 10 years and received hemodialysis for 10 months. Past medical history included diabetes mellitus and hypertension. He received a kidney transplant in another hospital, and the immunosuppressive regimen after transplant included prednisolone (60 mg/d), mycophenolate mofetil (1 g twice daily), and tacrolimus (3 mg twice daily). At 1 week after transplant, a surgical wound infection was observed. The sutures were opened and pus was evacuated. Despite broad-spectrum antibiotics (imipenem, vancomycin, and ciprofloxacin) and 3 débridements, the soft tissue infection worsened. At 45 days after transplant, the patient was referred to Imam Khomeini Hospital. He had fever and a large purulent wound that was surrounded by a black necrotizing margin. There was yellow discharge noted across the abdominal wall distant from the surgical incision (Figure 1). The bacterial culture from the wound showed no growth. Broad spectrum antibiotics were continued. Mycophenolate mofetil and tacrolimus were discontinued and the dosage of prednisolone was decreased to 30 mg/day. The patient had a biopsy of the skin and soft tissue at the wound margin and underwent massive debridement, which showed full-thickness abdominal wall necrosis. Debridement was incomplete because of the potential risk of exposed abdominal viscera. Empiric antifungal therapy with amphotericin B (70 mg/d) was started. 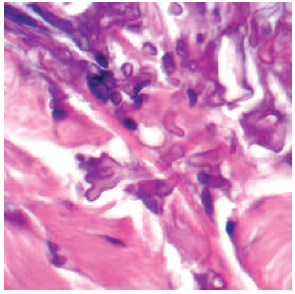 Histopathology showed broad fungal hyphae without septation, consistent with the diagnosis of mucormycosis that invaded the subcutaneous tissue (Figure 2). Additional wound debridement was performed, but the patient died of septic shock at 52 days after kidney transplant. The average time from transplant to occurrence of mucormycosis is 60 days (range, 1 d to 8 y).9 Risk factors for mucormycosis in organ transplant recipients include kidney transplant, posttransplant diabetes mellitus, and previous use of voriconazole and caspofungin; whereas tacrolimus may be associated with a decreased risk of developing mucormycosis.6,11 The present patient developed signs of infection at 1 week after transplant, and he had several risk factors for mucormycosis including chronic kidney disease, long-term diabetes mellitus, kidney transplant, and immunosuppressive therapy. Kerbaul F, Guidon C, Collart F, et al. Abdominal wall mucormycosis after heart transplantation. J Cardiothorac Vasc Anesth. 2004;18(6):822-823. Zirak C, Brutus JP, De Mey A. Atypical cause of forearm skin ulceration in a leukaemic child: mucormycosis. A case report. Acta Chir Belg. 2005;105(5):551-553. Becker BC, Schuster FR, Ganster B, Seidl HP, Schmid I. Cutaneous mucormycosis in an immunocompromised patient. Lancet Infect Dis. 2006;6(8):536. Arnáiz-García ME, Alonso-Peña D, González-Vela Mdel C, García-Palomo JD, Sanz-Giménez-Rico JR, Arnáiz-García AM. 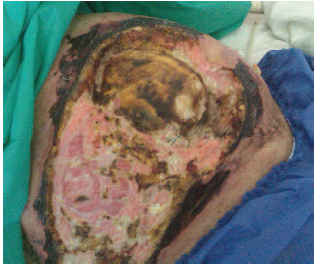 Cutaneous mucormycosis: report of five cases and review of the literature. J Plast Reconstr Aesthet Surg. 2009;62(11):e434-e441. Flagothier C, Arrese JE, Quatresooz P, Pierard GE. Cutaneous mucormycosis [in French]. Journal de Mycologie Médicale. 2006;16(2):77-81. Godara SM, Kute VB, Goplani KR, et al. Mucormycosis in renal transplant recipients: predictors and outcome. Saudi J Kidney Dis Transpl. 2011;22(4):751-756. Grossklaus DJ, Dutta SC, Shappel S, Kirchner FK. Cutaneous mucormycosis presenting as a penile lesion in a patient with acute myeloblastic leukemia. J Urol. 1999; 161(6):1906-1907. Rammaert B, Lanternier F, Zahar JR, et al. Healthcare-associated mucormycosis. Clin Infect Dis. 2012;54(suppl 1):S44-S54. Page AV, Evans AJ, Snell L, Liles WC. Primary cutaneous mucormycosis in a lung transplant recipient: case report and concise review of the literature. Transpl Infect Dis. 2008;10(6):419-425. Walsh TJ, Gamaletsou MN, McGinnis MR, Hayden RT, Kontoyiannis DP. Early clinical and laboratory diagnosis of invasive pulmonary, extrapulmonary and disseminated mucormycosis (zygomycosis). Clin Infect Dis. 2012;54(suppl 1):S55-S60. Petrikkos G, Skiada A, Lortholary O, Roilides E, Walsh TJ, Kontoyiannis DP. Epidemiology and clinical manifestations of mucormycosis. Clin Infect Dis. 2012;54(suppl 1):S23-S34. Lineberry KD, Boettcher AK, Blount AL, Burgess SD. Cutaneous mucormycosis of the upper extremity in an immunocompetent host: case report. J Hand Surg Am. 2012;37(4):787-791.